The beginning of a new year is always a great time to game plan for any projects you might have lined up for your home and property. At First Cut General Contractors our expert team of builders and contractors are ready to help you tackle any remodel project you might have, big or small. But for many of us, large remodel projects might not be in the budget for this year. So in the meantime, we have put together several small and manageable remodel projects that will bring some life to your home as well as potentially increase its value. If you’re interested in increasing the resale value of your home, many experts propose remodeling your kitchen and bathrooms first. And over time, the wear and tear shows easier in these rooms. But you don’t have to do a complete overhaul and reconstruction to make an improvement. Small changes will make more of a difference in the overall appeal of these rooms than you might think. You can start with small improvements such as painting your kitchen cabinets and installing a new backsplash. 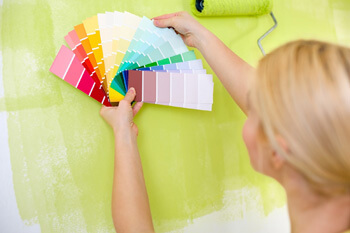 Even simply repainting the kitchen and bathrooms will quickly give the space a fresh and inviting new look. You could also consider changing the light fixtures and installing new plumbing fixtures. 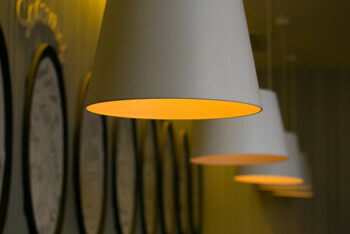 Shop around for affordable lighting kits that will give the space more versatility and ambiance. And new plumbing fixtures such as a new faucet is one of the quickest ways to make these rooms feel new and updated while allowing you some creative freedom as well. 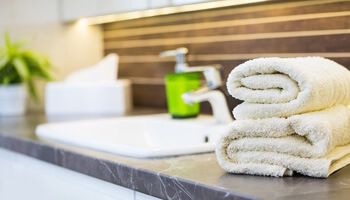 Refreshing the decor in your bathroom with new towels and a new rug will also quickly make it feel like new again. Never underestimate the power of a fresh coat of paint. Whether you’re tackling the entire exterior of your home, or simply painting your living room space- making the decision to repaint is always a quick and affordable way to improve your home. You can quickly deliver a brand new look in your home and the options for personalization are endless. If you do decide to master your paintbrush and roller skills, make sure to do it correctly the first time after researching the correct paint for the surface you are tackling. And don’t cut corners to save time! Invest fully in all of the surface preparation steps and strategic taping to guarantee a strong and sharp new look. When taking on remodel/home improvement projects, it’s easy to get caught up with the projects inside of the home. Take a minute to pull your focus to the outdoor space, and you’ll find these improvements just as enjoyable and satisfying to complete. The addition of a patio or deck instantly improves the outdoor space and opens up the door for more outdoor recreation activities when weather permits. And when considering the construction of these spaces, don’t forget to think about providing shade as well. 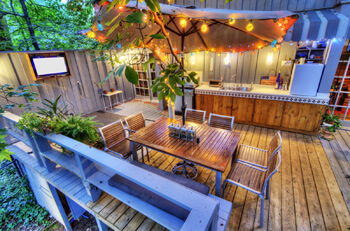 Adding a place for a shady retreat quickly adds value and comfort to your outdoor yard space. If you’d like to improve the aesthetic of your outdoor space, but aren’t feeling too confident in your lumber skills- don’t worry, there are plenty of other small ways to incorporate some improvements. One of the easiest ways is the incorporation of more plant life through small garden areas and large potted plants. Use potted plants to instantly fill in empty spots around the yard. We also suggest using brick and concrete pavers for a durable and affordable addition to the framework of your existent outdoor space. They come in a variety of colors and styles and are extremely easy to work with. If you’re looking for additional inspiration check out our article here on completing your outdoor space efficiently! The window treatments in your home can sometimes get overlooked when making updates to the interior of your house. And although they are easily overlooked by your eyes since you see them daily, it can make a huge impact when they are replaced with a new look. Window treatments have come a long way from your traditional shades and you can now choose from a variety of materials including wood and bamboo. Take some time to research your possible varieties, materials and colors but keep in mind what works best for your home and desired lighting throughout the year. It is incredible how quickly changing out a light fixture or bulb can instantly change the entire feel of a room. Many homeowners aren’t using their existing light fixtures to their full advantage by purchasing the correct light bulbs for their lamps and overhead lights. In addition to making sure you’re buying the correct bulbs, you might want to consider buying new light fixtures as well. The installation of track lighting allows you to direct the light exactly where you want it as well as allowing you the freedom to move it at any time. Track lighting sets are versatile and adjustable and they illuminate the colors in your home very nicely. And over the years the price of track lighting kits has decreased significantly, making them an even more attractive and affordable option to improve your home. Overall, there are many small improvements that you can make this year that won’t break your back or your budget. And if you’d like to go a step further and plan a more involved remodel project, we are just a phone call away!